Follow this step-by-step tutorial to create a handy client-side tool for uploading/downloading files. The detailed instructions will help you create a component on a page, adjust its configuration and immediately start working with files. First of all, create an HTML file and call it myVault.html. Then proceed with including Vault source files into the created file. The detailed description of the dhtmlxVault package is given here. the link to the Google Fonts source file for correct rendering of fonts. As parameters, the constructor function takes the HTML container to place Vault into and the Vault configuration object. target - (string) obligatory, the path for upload. Other configuration options are optional. See the full list of configuration options. Later you can change the Vault configuration. Read about the possibilities of adjusting Vault to your needs. 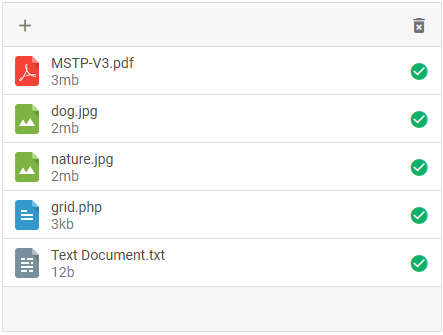 Now Vault is ready for uploading and downloading various types of files.